The new 2013 EU directive for the prevention of sharp injuries will require all healthcare organisations to introduce measures to assist in the reduction of the 400,000 occupational injuries reported each year. A number of organisations have already converted over, where practically possible, to safety engineered devices which can help to improve user safety thus reducing the cost of treatment associated with injured workers and avoid potentially expensive litigation. The Operating Department can often be overlooked when considering sharps injury prevention since a third of incidents occurring between 2000-2007 were on the ward or in A&E, 43% and 37% respectively, compared to 20% in the OR, most of which would have been preventable with the correct application of universal precautions and safe disposal of clinical waste. A study by Thomas and Murray published in the Annals of the Royal College of Surgeons, England in 2009, showed that in a study of 98 UK surgeons in a large district Hospital, 44% anonymously admitted to having had a needle stick injury. The study concluded that "under reporting" of such incidents was probable particularly within the surgical disciplines. The objectives of the new EU directive can be summarised as: 1) To achieve the safest possible working environment; 2) To prevent workers injuries caused by medical sharps; 3) To protect workers at risk; 4) To set up an integrated approach establishing policies in risk assessment, risk prevention, training, information awareness raising and monitoring; and 5) To put in place response and follow up procedures. The prevention of injuries caused by all medical sharps is the overriding objective of the new Directive and this is hoped to be achieved by applying a number of control measures within the working environment. These would be: 1) Elimination of unnecessary use of sharps through changes in working practice identified during risk assessment; 2) Safe Procedures to be clearly specified and implemented for the use and disposal of sharp medical instruments and contaminated waste; 3) Engineering Controls enabling the provision of medical devices incorporating safety mechanisms and protection; and 4) PPE - the use of personal protective equipment such as gloves, gowns and masks. The "it will never happen to me" perception of many healthcare workers could hinder the roll out of the new Directive however exposure to a blood borne virus only has to happen once to change their life. Studies do suggest that exposure through sharps related injuries is on the increase so consideration has to be given to both personal and financial risks of not taking the necessary precautions or abiding by new and existing protocols. The new legislation has arisen from a need to prevent the personal risks of sharps injuries and ultimately exposure to a blood borne virus and reduce the incidence and prevalence of occupational acquired diseases within the healthcare environment. Swann-Morton offer a number of safety related devices within their range. 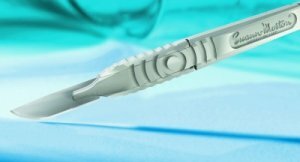 The Sterile Single Use Blade Remover can be used to remove the blade at the point of the operation. It encapsulates the contaminated sharp which remains visible for the post operative count and can then be disposed of in an appropriate sharps container. The Retractable Safety Scalpels can enhance existing safe passing protocols and can assist in reducing potential sharps handling related injuries in such areas as GP practice, trauma, paramedics and the A&E department where sharps handling is less frequent and the working environment less structured than the OR itself. The "new" Cygnetic range for Orthopaedic and general surgery is designed so the blade can be easily fitted into the handle using a unique lever operated system and the blades, once contaminated, can be dropped off into a sharps container without the need for any further handling. Swann-Morton can also offer in house safety training days relating to good practice when handling surgical blades so please contact our Customer Support Manager, Mr. Adrian Glossop for further details on telephone number (0114) 2344231 or by e-mail at aglossop@swann-morton.com. The complete original article written by Graham Johnson, RSCPHN (OH), clinical lead-nursing, Bupa Health and Wellbeing is published in The Clinical Services Journal, Page 21-24, June 2011 and is accessible via www.clinicalservicesjournal.com.